Publisher: Goulburn River Valley Tourism Design, sales and print: Prominent Group All photos in the Holiday Planner (and more) can be found in our online photo gallery at www.heartofvictoria.com.au We gratefully acknowledge and thank our partner councils, Mitchell, Murrindindi, Strathbogie and Greater Shepparton and the industry for their assistance with content and images for the Holiday Planner. 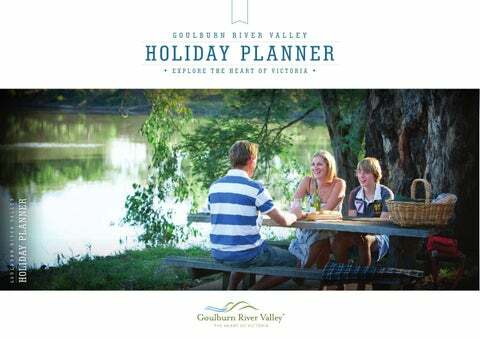 NOTE: Goulburn River Valley Tourism endeavours to ensure the information in the Holiday Planner is as accurate as possible at the time of print, but does not accept liability for any personal injury, damage to property or responsibility for the results of any actions taken on the basis of information in this publication or for any errors or omissions. As information may change we encourage you to visit www.heartofvictoria.com.au for the most up to date information. popular lifestyle and holiday destination. Explore our region’s events and festivals, great food and wine, fabulous farmers’ markets, the Great Victorian Rail Trail, art and culture, history and heritage – we have it all in the Goulburn River Valley region. FINDING YOUR WAY AROUND: We have developed this Holiday Planner to showcase the best our region has to offer. To help you find your way we have colour coded the towns and developed icons that feature throughout. with artists demonstrating their passion and skills. and road cycling in the warmer months. Farm Autumn Festival to sample what is on offer. Unique events like the Murchison Tomato Festa and Nagambie on Water (NOW) Festival showcase the beauty and diversity of our region. across the country. Or kick back at the Kilmore Celtic Festival, a long standing winter event that includes Irish dancers, Celtic music and markets. Families will love KidsFest at adventure playground KidsTown in Shepparton, while lovers of live music and warm hospitality will enjoy the Foggy Mountain Bluegrass Festival in Kinglake. and Fruit Salad Day in Mooroopna showcase the individuality and pride of our towns. Show and Shine in Euroa, Cranksters Hot Rod Show in Nagambie and Spring Car Nationals in Shepparton. THERE ARE ALSO MANY TOUCH SCREENS AVAILABLE THROUGHOUT THE REGION. THE MIGHTY GOULBURN RIVER CREATED AND SHAPED THIS INCREDIBLE VALLEY, WINDING THROUGH PLAINS AND VAST MOUNTAIN RANGES, THROUGH TOWNS, VILLAGES, FARMS AND STUNNING BUSHLAND IN BETWEEN. EXPLORE AND ENJOY THE SHEER MAJESTY OF THIS UNIQUE AND DIVERSE NATURAL ENVIRONMENT. The Goulburn River, along with the beautiful Nagambie Lakes, Lake Eildon and the National Parks and reserves are home to many species of native mammals, frogs, reptiles, fish, insects and over 100 species of native birds. Pack a picnic, wander along the tracks or enjoy the camping areas in many of our region’s State and National Parks. There are walking trails that cater to all fitness levels, be it a slow stroll or challenging overnight hike. You will be amazed and the variety and beauty of the parks available to explore in the Heart of Victoria. One of the great ways to experience the delights of this region is on the water. Whether you want fast paced water activities or the peace and tranquillity of the natural surrounds, you will find it in the Goulburn River Valley. Drop in a line and explore the banks of the river and lakes – hours of enjoyment await you and your family in our region. NEED TO KNOW MORE? Visit www.parkweb.vic.gov.au to discover more about our State and National Parks. best areas in Australia to get out and get going. a swim or drop in a line to catch the elusive big one. and experience the natural beauty and terrain. Victoria and offers activity galore! picturesque Trawool Valley and follows the Goulburn River to Yea and Molesworth before heading to Alexandra, Yarck and beyond. Experience the many river crossings, lakes, old rail lines, parks, waterfalls and you might be lucky enough to come across some of our local wildlife. The Dookie Rail Trail offers a completely different experience, with views of the seasonal crops and fertile farmland including the Dookie red loams. PLAY A ROUND Our region’s golf courses are challenging and picturesque, located along some beautiful waterways with panoramic views. Make sure you book in a round when you next visit. secrets over a tasting glass or two! and excellent food can prove irresistible! producing rich and complex wines with distinctive regional character from the ancient, deep red soils of the weathered ranges and the alluvial loams of the fertile river flats. The region is home to many food and wine events including the Marysville Sparking Wine Festival, Dookie Wine Show, Victorian Wine Show and Aussie Wine Month. from the valleys to the ranges, create a number of microclimates which produce a diversity of award-winning wines bearing a distinctive regional character. The region’s signature grape varieties include Marsanne, Roussanne, Shiraz, Vigonier and Grenache, lovingly crafted into award-winning wines by master winemakers. Visit www.heartofvictoria.com.au to find out about these, and many more, amazing wine events. extensive ‘on tap’ options. Of course the region’s fresh produce has also made it to the menu in our local pubs, transforming the traditional ‘pub meal’ in to something truly special. the produce we have on offer. If you fancy a five star meal, a café with sidewalk dining, a hearty dish by the log fire or a good old fashioned counter meal – you can take your pick in the Heart of Victoria. breakfast before heading out. After you have been out exploring the region by day, indulge and spoil yourself and your friends and family by night. sheds, cottages and rural outbuildings of yesteryear. These buildings stand as testament to the thriving communities of a different era that helped shape the Heart of Victoria. Victoria’s rich and colourful past. rich tapestry of our region’s history. PERHAPS IT’S THE BEAUTY OF THE LANDSCAPES THAT INSPIRE. OR MAYBE THERE’S SOMETHING IN THE WATER. EITHER WAY, THERE’S NO DOUBT THIS REGION BRIMS WITH CREATIVE TALENT SPANNING THE ARTISTIC SPECTRUM. FROM ACCLAIMED PUBLIC GALLERIES TO SPECIALISED SPACES SHOWING PHOTOGRAPHY, GEMS, SCULPTURE AND CONTEMPORARY PAINTINGS. ART EVENTS From big festivals to intimate performances, visitors will be delighted, moved and amazed by a feast of fabulous artistic offerings across the region and throughout the year. Be sure to visit www.heartofvictoria.com.au to stay up to date with what’s happening. Aboriginal and Torres Strait Islander artists. Museum, affectionately known as SAM, to exhibition spaces in beautiful historic buildings to the many lovely public gardens and parks, art traditional and contemporary, exquisite and bold, can be found around in the most likely, and unlikely of places. SAM is home to one of Australia’s most important collections of ceramics including such treasures as objects made by the first convict potters and by early studio potter, Merric Boyd and the artists associated with the Arthur Merric Boyd Pottery at Murrumbeena, notably, John Perceval and Arthur Boyd. sample the creative delights of the Heart of Victoria! LOVE A GOOD MARKET? Look no further. There is something for every taste and interest in the Goulburn River Valley region. For a full list of markets in the Heart of Victoria see Page 5.
region is a perfect destination for families. Victorian Rail Trail or Dookie Rail Trail. spectacular waterfalls dotted around the area. fish, ride a horse or spot a platypus in the Goulburn River. The kids will love seeing kangaroos, wallabies, koalas and other native animals in their own environment. TIP FROM A LOCAL Take the family to KidsFest in Shepparton in September! Victoria’s largest outdoor children’s festival is fun for the family with rides, live stage shows and activities for all ages! Lake Mountain Alpine Resort is a great family location all year round. Cross country skiing and tobogganing in winter and mountain biking or hiking the highlands in summer. The whole family can experience the great outdoors in this scenic location. or the RV with supplies for the road trip ahead. buys and have a chat with the friendly locals too! vehicle parking for holiday makers with caravans. gift to surprise friends and family at home. EXPLORE Our regions Visitor Information Centres stock a great range of local gifts for you to take home and share with friends and family. privacy and charm in mind. Eildon or a farm stay experience like no other, we have accommodation to cater to all tastes and budgets. Each township in the Goulburn River Valley has an individual charm and accommodation to suit. It is a matter of finding what you like best! LOOKING FOR A VENUE? The Goulburn River Valley region has venues suitable for all styles of conferencing, weddings, events and functions. Whatever you are planning the Heart of Victoria has a venue to cater to your requirements. the riverside in the Marysville State Forest and at Murrindindi Scenic Reserve, or choose a secluded campsite at The Gums in Kinglake National Park. Parks, forests and reserves right across the region offer camping and scenic picnic spots to suit anyone and everyone. of Melbourne’s skyline from Kinglake National Park. Experience the breathtaking vistas from the summit of the Cathedral Range. And that’s just for starters. 1. 2. 3. 4. 5. 6. 7. Lake Eildon National Park Kinglake National Park Yarra Ranges National Park Cathedral Range State Park Goulburn River Murrindindi Scenic Reserve State Forests – Marysville, Rubicon, Black Range, Toolangi, Big River Refer to the map on page 7 for locations. WATERFALLS Dozens of waterfalls are dotted throughout the region, each with a character and timeless beauty of its own and some more accessible than others. Well worth a visit are the renowned Steavenson Falls at Marysville, the cascades along Lady Talbot Drive and the peaceful Cora Lyn Falls near Cambarville. Lucky visitors will see lyrebirds at Masons Falls at Kinglake and the impressive single long drop at Snobs Creek Falls on the way to Eildon. FOR MORE INFORMATION Visit Parks Victoria www.parkweb.vic.gov.au or Phone 13 19 63. Department of Environment, Land, Water and Planning www.delwp.vic.gov.au or Phone 13 61 86. WATERSPORTS AND FISHING Lake Eildon and the Goulburn River were recently voted Victoria’s most popular freshwater lake and river fishing spots. Flowing from the magnificent Lake Eildon, the Goulburn River and its tributaries are much loved by fly fishers and native fish anglers alike. Don’t forget the wheelchair accessible fishing platform on the pondage in the Eildon township for those needing easier, safe access to this premier fishing location. Attracting national attention for its array of fishing opportunities, there are many places to throw in a line throughout the region. Lake Eildon attracts thousands of water sport enthusiasts all year round. With over 500km of shoreline, it’s a great place for all kinds of recreational water sport activities - from wake boarding and water skiing to the more peaceful pursuits of fishing and houseboating. CULTURE AND HISTORY The land just beyond the Great Divide has been culturally significant to Aboriginal people for thousands of years and many continue to have strong connections to country today. The region’s post-European history is also evident with many places still reflecting their early heritage of gold mining and timber harvesting. Cambarville Historic Township and surrounding area in Yarra Ranges National Park is a great place to discover how the early pioneers of the area lived and worked and learn about their remarkable feats of engineering and timber milling that shaped the region. Visit the Rubicon State Forest and see evidence of Victoria’s first hydro-electric scheme and the timber tramways from the timber harvesting days. There are many more historic locations to explore. and finish at the foot of Mt Buller and Mt Stirling. Gentle gradients along the trail are generally easy for walkers and cyclists alike making the trail suitable for all ages and most levels of fitness. DID YOU KNOW? The trail is ideal for family day-trippers, weekend adventurers or longer-stay holiday makers with a string of picturesque villages between Tallarook, Alexandra and Mansfield offering a range of accommodation typesÂ to suit all tastes and budgets. are within 15kms of the Great Victorian Rail Trail. Narbethong offers hearty meals at the local pub alongside beautiful accommodation overlooking the dense vegetation. destination for lovers of nature and the outdoors. scenery and extensive year round activities, with vast expanses of forest and pristine waterfalls to discover. visit is complete without experiencing some of the beautiful natural terrain by foot, bike or horse. Enjoy the T Bar & Lounge where an open fireplace awaits in you in winter and in warmer months you’ll appreciate the icy cold craft beers & ciders on offer. There’s a rooftop deck, spacious courtyard, function room and to cap off your stay, treat yourself to a fine dining experience at the Vibe Hotel, directly opposite. rivers and streams that are great for fly-fishing. There are 16 luxurious, air-conditioned rooms with double size showers. King suites have the luxury of a freestanding bath within the room plus wireless internet and Foxtel is provided for all guests. Winner of the TripAdvisor Award for Excellence, this family owned and operated motel has everything the discerning traveller is after. The Tower Motel also offers a chauffer driven tour service in a luxurious Mercedes Benz Viano. Take in the sights, view the natural scenery, taste local produce, sip on some local wines and be given a real insight of the area first hand by local himself, owner David Stirling. And after a big day out, treat yourself to one of the many massage and relaxation packages. The Tower Motel is conveniently located close to a variety of walking and bike trails, waterfalls, retail shops and everything else that magestic Marysville has to offer. And it’s all just 80 minutes from Melbourne, 25 minutes from Lake Mountain Ski Resort, an hour from Mansfield and a leisurely 30 minutes from Lake Eildon. The perfect fun day out for the whole family! Young kids through to the grandparents can all be thrilled by hooking onto one of the trout or salmon in the picturesque, natural bush fishout. Amelina Cottages Marysville are traditional country cottages for couples or small families. Set opposite the State Forest, on over half an acre of cottage gardens, Amelina Cottages are a short two-minute stroll over the Steavenson River to the heart of the Marysville village. Fully equipped kitchens, real wood fires, air conditionaing, spas. AAA4 star. Known as the mystic gateway to food, wine and hospitality, the Black Spur Inn offers a diverse selection of traditional and specialty dishes influenced by the flair of highly trained chefs. A popular destination, the restaurant serves breakfast, lunch and dinner 7 days a week and lends itself for family functions, conferences and meetings. Two spacious self contained cottages of contemporary design nestled within a very peaceful setting, amidst an orchard of chestnut trees, surrounded by the mystic mountains. The cottages can sleep up to four and have open fires and spas. Children and pets are welcome. Every season is a delight. Packages available. Australia’s first commercial trout hatchery is a family owned and run farm, growing quality Rainbow Trout & Atlantic Salmon in the pristine waters of the Victorian Alps and no antibiotic chemicals or growth hormones are used. Be sure to try the Traditional Mountain Ash Smoked Trout and their hand-milked Caviar, or just enjoy the peace and quiet with a spot of fishing. Buxton is just a 90 minute drive from Melbourne that will take you through some beautiful wilderness. Open 9am – 5pm daily. Multiple award winning Barton Mill is finished to the highest of standards. This family friendly self-contained house features 3 bedrooms with period detail throughout. Accommodating 1 to 6 people and offering individual bathroom facilities to all 3 bedrooms. Linen and toiletries are provided. Features large alfresco deck with mountain views and wood fire all in a central location. Just 90 minutes from Melbourne with a ‘million miles away’ feel, the historic Black Spur Inn, with stunning forest views, invites you to indulge in the perfect getaway. Offering hotel suites, cabin units or a lodge for larger groups, all with the comforts one would expect. Be sure to ask about their various special seasonal getaway packages. Vibe Hotel Marysville opened its doors in January 2015, connecting you to the heart of this picturesque region. Contemporary and environmentally sustainable, the 101 stylish rooms provide a sanctuary for guests alongside a relaxing wellness area, gourmet cafe, deli and bakehouse. The hotel also boasts a modern Australian restaurant, Radius Bar & Grill led by Executive Chef Leigh Colville, showcasing produce locally sourced within a 100km radius. Come & play at the beautiful Marysville Golf & Bowls Club. Surrounded by magnificent forested hills with the Steavenson River meandering through the course, it is a delight to play all year round. There is also an all-weather bowling green & visitors can hire both golf & bowls equipment. Delight your senses at the treasure trove of Marysville. Lit & Beyond is where you’ll find a retail experience to remember with exquisite lit candles in a spectrum of colours and scents plus clothing, jewellery, assorted scarves and much more. Open 11am – 4pm Wednesday to Sunday, public holidays and every day during Victorian school holidays. Imagine unwinding in a two-person spa or elegant claw foot bath with the flicker of a gas log fire keeping you cozy. There are 8 beautifully detailed cottages to choose from, designed for couples, all have a private garden veranda with mountain views, right in the heart of town. Packages and vouchers available. The newly refurbished clubhouse includes “The Bunker” restaurant, open to the public Wednesday to Sunday for lunch and dinner. Children’s meals available & visitors can enjoy fresh, local ingredients whilst taking in the spectacular views over the course & beyond on the fantastic outdoor deck. Stay & play packages are available, families & group bookings welcome. Moondani Marysville is a unique retreat experience. New, modern and thermally efficient accommodation overlooking the beautiful mountains of Marysville, Moondani also offers optional in-house spa treatments using Li’tya Australian native aromatic oils and skin care. Moondani is an idyllic space, luxuriously appointed and perfect for romantic retreats or time away with family and friends. Meander this private and picturesque property with its numerous walking paths, try your hand at fishing or just paddle out on the lake. There are two B&B style retreats (disabled friendly) or if travelling with a group, the lodge can more than cater. Plus full Conference Facilities, Event areas for parties/weddings and a Cafe and Produce Store on weekends. you can see a recreation of the bush sawmillWest and 1950.
the region, and is the perfect place to stop and rest Strath Creek along the Great VictorianKilmore Rail Trail. find goldmining relics and pretty wildflowers. a delightful country pub and cafés and a terrific General Store that welcomes weary riders. or two in this freshwater fishing mecca! A paradise for bushwalkers and birdwatchers, Cathedral Mountain in the Cathedral Range State Park, towers over the little township of Taggerty. This fascinating tourist railway and museum features local timber history from the Rubicon Forest and other historical displays from one of the largest machinery collections in Australia. The museum’s two main events are the Easter Gala and the Heritage Machinery Festival on the second Saturday in September. There’s lots of childrens activities, a picnic area and the Great Victorian Rail Trail that starts and ends at the Timber Tramway. The Alexandra Market is held on the second Saturday of each month from September to May and features a large variety of stalls and train rides. Escape to BIG4 Taggerty Holiday Park, located in a pretty bush setting on the banks of the Acheron River with the Cathedral Mountain as the back drop. Stay in one of their fully self contained ensuite cabins where you might spy a platypus whilst sitting on the decking overlooking the Acheron River. Take your caravan or tent to camp on one of the shaded powered/ unpowered sites. Breathe clean fresh air and enjoy the great outdoors, take it easy or be active! Enjoy the park’s facilities, including a swimming pool, jumping pillow, playground, tennis courts and mini golf. The museum opens from 10am till 4pm with steam train rides on the second Sunday of each month and diesel powered train rides on the fourth Sunday. Groups and families are very welcome. Just over 2 hours from Melbourne, simply travel up the Maroondah Highway or take the Hume Freeway. or taste some delicious cherries, direct from the Koala Country Orchard. There is also terrific accommodation available. The Commercial Hotel is a welcoming place to stop for a drink and a chat, enjoy a meal with friends and family or pick up some local wine. Open daily from 11.30am until late. If you are looking for accommodation, be sure to spend a night or two in our clean and relaxed historic country hotel. Located just 5 minutes from Alexandra, this park nestled in the Acheron Valley offers everything! Apart from deluxe and ensuite cabins plus shaded camping spots along the edge of the Goulburn River, there’s always plenty to do with a jumping pillow, solar heated pool, tennis court, mini golf, fishing, recreation room and even go-kart hire! Their fleet of houseboats offer a unique accommodation experience for visitors to explore and truly appreciate the tranquillity and serenity of the pristine waters and magnificent surroundings of Lake Eildon. There are 10 and 12 berth houseboats catering for all levels of comfort and budget, from basic through to two storey luxury incorporating a spa. Centrally located in Thornton between Alexandra, Marysville and Lake Eildon, this locally owned and operated business boasts 24 motel rooms, a spacious bistro, bottle shop, Tattslotto, large Sports Bar with TAB, Fox Sports, Post Office, free Wi-Fi and a courtesy bus. The perfect spot for fishing, boating, four wheel driving, horse riding or just chilling by the river. This unique local produce store offers handmade sushi, pasta and biscuits plus an array of other goodies and their take home meals feature fresh, flavoursome ingredients. Drop in for a coffee and to see all the region has to offer. Open Tuesday to Friday 9am - 6pm, Saturday 9am - 4.30pm and on Sundays during summer from 9am -4pm. Located in the heart of Alexandra this thriving café uses the best of local produce to create a modern breakfast and lunch menu. Sit back and enjoy quality pavement, courtyard and inside dining. Essence also serves quality coffee, traditional teas, cakes and assorted local produce. Open Mon-Fri 6am to 4pm, and weekends 7am to 3ish. Nestled along the banks of the magnificent Eildon Pondage, you won’t find a better location! BYO tent or caravan or stay in one of the comfortable cabins. Located on 30 acres of parkland, there is great fishing spots within the park, a Giant Kangaroo Jumping Cushion, playground, camp kitchen with pizza oven and even a tennis court! Built in the early 1900’s, Waverley Guest House has been tastefully renovated to provide boutique Federation style accommodation. Each apartment offers spacious rooms and comfortable living. Located in the heart of Alexandra you will find shops on your doorstep, the Rail Trail a short ride away or the rest of the Murrindindi Shire within easy reach. For something homemade and delicious you’ll love Giddy Goat’s creamy vanilla slices, tasty sausage rolls, popular fish & chips and great coffee! Open 6am to 4pm Thursday to Sunday. Dine in or takeaway. Fully licensed. Glenfield Cottage provides self-contained accommodation for up to four people in a cosy, private, two bedroom cottage. All linen is provided and there is a fully equipped kitchen for your convenience. Weekly or overnight stays available. Our 100% natural soap and beauty products are made from locally grown extra-virgin olive oil. Come in and hand test liquid soaps and browse the large range of aroma-therapeutic skin care items, gifts and local edible produce. Step inside either of these freestanding, converted, open plan church buildings and you enter a comfortable haven, stylishly decorated and ideally located in the foothills of the Great Dividing Range. Perfect for a romantic getaway or family retreat. Visit CherriShed for tastings and sales of fresh cherries, straight from the orchard. Select from cherry liqueurs, preserves, sauces and cherrythemed gifts. Open mid November until mid January, 7 days a week, 9.30am to 5pm. A general store with the lot! Great coffee, dine in or takeaway food, post office, newsagents and groceries. Open every day. Renovated, self contained two bedroom cottage. Each room with king bed and ensuite. Fully fenced and pet friendly. We sell pre-loved, affordably priced books and magazines for the whole family. Our wide range of subjects includes a large military section. Open Monday 11.30am to 3pm, Thursday and Friday 11.30am-4pm, Saturday and Sunday 10.30am to 5pm. This authentic country pub is open daily from noon with dinner served every night with lunches Wednesday to Sunday. Takeaways are available and you’ll love the outdoor area with its own Beer Garden and outside pool table. WITH THE GREAT VICTORIAN RAIL TRAIL LITERALLY ON YARCK’S DOORSTEP, THIS TRADITIONAL COUNTRY TOWN IS THE PERFECT BASE FOR DISCOVERING JUST WHAT THE HEART OF VICTORIA HAS TO OFFER. – an important breeding site for over 100+ species of birds and the closest classified wetlands to Melbourne. importance of rail transport in the early settlement. Flowerdale Estate historic homestead property has a long history dating back to 1842 when the original homestead was built. Flowerdale Estate is now a family owned and operated business. With many years of experience in the service and hospitality industry, and a team of professional and dedicated staff, our aim is to make every part of your stay with us a most enjoyable and successful one. Handcrafted premium quality wines together with exceptional sourdough breads are produced in Glenburn by craftsman winemaker Philip Lobley and artisan baker Lynn Cunningham of Wild Crust Bakery. People are now able to stay over on weekends and enjoy our fantastic facilities, such as indoor heated pool, an undercover tennis court and the King Parrot Creek. Our restaurant “Gracies” opens for dinner Friday and Saturday nights, and offers traditional high tea and high tea royale every Sunday. Bookings are essential. Philip has 25 years experience in the wine industry and established his Close Planted vineyard in 1995. The unique micro climate produces exceptional grapes that are transformed into wines of elegance and power. Their products are available locally from a number of retail venues in the Murrindindi Shire, market outlets or by visits by appointment to their unique property. Wild Crust Bakery is only one of a handful of traditional wood fired baking ovens operating in Victoria and has built a legion of fans for their ‘real breads’. Mount Hickey, Horan’s Track and much more. This homestead is nestled in the ‘Valley of a Thousand Hills’, an easy one hour’s drive north of Melbourne. It’s promised that when you settle in, it will feel like you are a million miles away. There are two fully selfcontained 3 bedroom cottages which can sleep up to 8 guests each. This is the perfect spot for celebrating a special occasion with your partner, family or close group of friends. There are facilities for guests horses and plenty of trails to explore around the area. Horse riders, cyclists, bushwalkers, birdwatchers and 4WD groups are welcome, just to name a few. Everyone can benefit from a weekend getaway and view the abundant wildlife this region has to offer - or maybe just to relive a childhood memory. Having established a reputation for their contemporary menu offering traditional pub fare as well as dishes for the discerning, this stylish hotel is now home to Yea’s newest luxury appointed accommodation. Enjoy a selection of cold beer, premium wines and ciders from the local region and beyond and relax with the family in ambient surrounds. This is your chance to relax in your own private cedar cottage whilst enjoying the spectacular views of the “Valley of Thousand Hills.” Sit on the balcony with a glass of local wine or in front of the wood fire with a complimentary port. Unwind in the clawfoot bath and in the morning enjoy a hearty country breakfast. Step back into another era in this charming hotel restaurant with its old English oak tables, comfortable chairs and two fireplaces. Visit the Railway Lounge where you can sit and enjoy a drink before dinner. The a la carte menu boasts country comfort food and the special seafood Sundays are popular amongst locals and visitors. Open for lunch and dinner Wednesday to Sunday. Gift Certificates available. From Sedona Estate’s humble beginnings, Paul & Sonja are proud to create regionally distinctive wines of impeccable quality from their high altitude vineyard. Visit our hillside Cellar Door and enjoy mesmerising views while sipping Sedona wines. Artisan gourmet platters are available on weekends. Open 11am - 5pm Wednesday to Sunday & public holidays. Located just 90 minutes north of Melbourne, Yea Motel welcomes visitors to a picturesque garden setting with heated pool and BBQ under the aged shady trees. The nine units are bright, clean and comfortable with three family rooms sleeping four in each. Twin share units are also available. All have queen beds and ensuites. Nestled on the banks of the Yea River is our early 1900’s period home, featuring three full sized bedrooms, (sleeps 8) full sized kitchen, split system, Coonara fireplace, TV/DVD player, laundry, BBQ, wide verandahs and outdoor setting. Fully enclosed backyard with gate access to Yea River. 300 metre walk to shops, restaurants, Yea Wetlands, park and Rail Trail. For an authentic country escape, head for the Yea Peppercorn Hotel located conveniently opposite the Great Victorian Rail Trail. The hotel, which was built in the 1860’s, boasts original features including an old style verandah, giving the ambience and warmth of a bygone era. There are a range of luxurious suites to choose from. Gift Certificates available. along the crest of the range. Lilydale and is the largest National Park within a short drive MELBOURNE a visit to the Murrindindi Scenic Reserve and the from Melbourne. spectacular Whilhelmina Falls! A visit to Toolangi should also include an ambling walk through the town’s lovely gardens, where you can discover Toolangi’s very own rose variety, ‘Toolangi Gold’. in October, Kinglake Ranges comes alive with the annual Foggy Mountain Bluegrass Festival, featuring some of the best Bluegrass musicians in the country. wonderful young bluegrass talent and of course many other performances featuring some of the best national and international Bluegrass artists. Supporting the economic redevelopment of the Kinglake Ranges, the festival showcases the best the region has to offer, in a family-friendly event with something for everyone. Kinglake is located close to Melbourne so why not make a weekend of it! While here be sure to visit our wonderful National Parks with an abundance of wildlife, majestic waterfalls and spectacular views. If you’re a thrill seeker, be sure to challenge yourself with the downhill mountain bike trails or if you’d prefer to take it easy, simply enjoy the peaceful scenery and visit our local wineries. Don’t miss a weekend full of great atmosphere, country hospitality and unique musical riches. Visit the Kinglake Produce & Artisian Market on the fourth Sunday of each month in the heart of the Kinglake township. Perched above Melbourneâ&#x20AC;&#x2122;s northern fringes, the Ranges are home to the vast Kinglake Ranges National Park and its stunning waterfalls, sweeping skyline views, tranquil picnic and camping spots, walking tracks and for the more adventurous, an exhilarating mountain bike track. And for a real taste of the Ranges while touring, call into a farm gate, the monthly markets or iconic eateries for some delicious local produce. facilities, cafes, bakeries and classic country pubs, it’s an ideal place to unwind and recharge. Why not pack a picnic or take the bikes and enjoy a day exploring this beautiful part of the world. memorial featuring battle memorabilia alongside monuments to early explorers Hume and Hovell. Nearby Mount Piper, just west of the town, offers scenic walking tracks, while the Mount Disappointment State Forest, south-east of town, encompasses the Sunday Creek Reservoir and the Strath Creek Falls, both offering spectacular views from the summit. from across Australia, held annually in April. city dwellers looking for a relaxing break. Sports Complex is the home of motorcycle sport in Victoria. Healesville Upper Yarra Reservoir Owned by Motorcycling Victoria since 1975, this unique facility comprises of enough land to house tracks suitable for up to nine different disciplines. The SMSC hosts numerous state, club, national and international events throughout the year, recently hosting the World Motocross Championships in 2001. The SMSC is also ideally-suited to host a wide-range of community events such as festivals, markets, and community social welfare programs, including corporate events. In 2015, the SMSC will undergo a significant $1.2 million upgrade with MV’s headquarters to be relocated from Melbourne. A brand new welcoming façade, and new community centre, with 360 degree views of the complex, will also be built. This SMSC is already a wonderful destination to visit, and with the vibrant town of Broadford just minutes down the road, there’s no reason not to rev your engines and experience the most comprehensive motorcycle sports facility of its kind in Australia. KILMORE CELTIC FESTIVAL Immerse yourself in Kilmore’s Celtic heritage on the last weekend in June with non-stop entertainment, music and dance! An annual exhibition featuring hundreds of quality paintings. Total awards valued at $5,500, attracting artwork by experienced artists from metro Melbourne and Regional Victoria. Enjoy exquisite artwork, also photography, glass art, woodwork, jewellery & more. Artist Demonstrations at the expo. Art & Roses Tours also available. All work is for sale. Held in April each year. Memorial Hall, Sydney St, KILMORE Ph: 0428 410 041 www.kilmoreartexpo.com Kilmore is Victoriaâ&#x20AC;&#x2122;s oldest inland settled town and your gateway to such a diverse range of activities. With regular festivals and some great shopping choices, simply jump in your car or hop on a train and use one of these unique properties as the perfect base for a well deserved getaway. LAUREL HILL COTTAGE Established in 1860, this charming 2 bedroom cottage is built on the site of stables within an historic, private property. It features both queen and twin bedrooms, fully equipped kitchen, spa bathroom, and entertainment centre. Relax in the rose garden or stroll around the historic and stunning gardens of the property. MERLIN PARK Your host Liz invites you to her beautiful and secluded farmstay apartment. With 3 bedrooms it sleeps up to five guests comfortably and includes a continental breakfast of homemade bread, jams and other delights. Pet friendly, Merlin Park is close to the train station, race track and golf course. BINDLEY HOUSE B&B COTTAGES Bindley House cottages are nestled within the beautiful gardens of historic Bindley House (an imposing 2 storey bluestone residence, circa 1862). Relax and indulge in luxury self contained cottages overlooking majestic gardens complete with 100-year-old elm trees, sculptured lawns and cottage garden colour. Located in the heart of Kilmore within easy walking distance to all amenities. can enjoy a wood fired pizza, or whole local pig! sit back, relax and enjoy a peaceful afternoon sampling the award winning brews at the brewery. Great coffee and old fashioned milkshakes made with home-made syrups are on offer at the General Store, which is the perfect spot to settle in by the pot-bellied stove and watch the locals go by. TIP FROM A LOCAL MELBOURNE Be sure to visit Tooborac in March for harvest celebration the Tooborac Autumn Festival. Featuring farm tours, sausage making, cooking demonstrations, children’s growing activities, market stalls, live music and much, much more! reasons to settle in and stay a while! the Shelmerdine Family has been among Victoria’s most prominent grape growers. With Healesville two Vineyards in Upper Heathcote Yarra they offer a variety of Reservoir wines. Wines on tasting include Shiraz, Grenache Rosé, Riesling, Viognier, Chardonnay, Nebbiolo and Syrah Grenache. Merindoc Café and Cellar Door is the ideal place to discover the balance and elegance of their wines and the Café menu is seasonally inspired. Cellar Door is open Saturday and Sunday 10am to 4pm. Merindoc Café is open Saturday and Sunday 11:30am to 2:30pm. McIvor Farm specialise in old breed Berkshire pigs free range, ethically raised pigs prized for their flavour. McIvor Farm is set amongst the beautiful granite boulders and rolling fields of Tooborac. The pigs assist in land regeneration by going about their piggy business. Visit Jason & Belinda at their farm gate shop – check the website for opening times. Generations of farming families have perfected techniques to produce arguably some of the best grapes, pork, olive oil, vegetables and beer Victoria has to offer and can be sourced from the quaint farm shop. Modelled on an Italian mixed farm, McIvor Estate is located at the Southern end of the Heathcote wine growing region. It produces premium award winning wines as well as extra virgin olive oils. Each Saturday and Sunday and Public Holiday (10am to 5pm) the doors of the Cellar Door are thrown open and people can enjoy the current releases of McIvor Estate’s range of wines and olive oils. Just an hour’s drive from Melbourne CBD, nestled amongst the ancient granite boulders of Tooborac, Mimosa Glen boasts a number of options for guests to enjoy a secluded country getaway. Choose to stay in the beautifully restored Mimosa Glen Homestead or plan a romantic getaway and book a weekend at Mimosa Glen Cottage. So you think your rabbit dish is the best? Well, here’s your chance to prove it at the Tooborac Rabbit Cook-Off! Judged by a panel of rabbit connoisseurs, entries are scored on presentation, taste, texture and imagination and after judging, everyone sits down to share each other’s creations. If you don’t wish to compete, why not join us for a shared table lunch? Proceeds to local community organisations. Tooborac General Store has the nostalgia of a local country store with genuine friendly service. Known for its good food philosophy, the café uses fresh local ingredients and caters for all dietary requirements. The store has take home meals, giftware, live bait, fishing tackle and licenses along with fuel, newsagent and mail services. Open every day. The historic Tooborac Hotel has been serving cold beer and great meals to weary travellers since 1857. With a craft brewery established onsite in 2009, the now named Tooborac Hotel and Brewery has become a muststop tourist destination for visitors to the region. The Tooborac Hotel serves meals at lunch and dinner, and stocks a wide selection of local wines. Its beer taps pour the range of Tooborac Beer, and all are welcome to view the brewery itself – built into the original Cobb & Co stables behind the hotel. Make sure you try one of the award winning pies! The inviting atmosphere is perfect for families, groups and clubs; all types of functions can be catered for. The Tooborac Hotel and Brewery is the perfect spot for your next getaway! Mt Samaria Enjoy some friendly hospitality when visiting Seymour State Park and Goulburn River Valley area. historic buildings now home to an array of cafes, galleries, restaurants and accommodation. quality, geological and cultural significance. Victoria’s premier regional commercial art gallery presents continuously changing exhibitions of internationally acclaimed Australian artists work. Wildlife, expressionist and traditional exhibited. The licensed restaurant is central within the C1872 multi-roomed gallery creating an elegant relaxed atmosphere. Gallery and restaurant open day & evening Wednesday to Saturday plus Sunday lunch. Eat like a local at Hock The Ruby café. Featuring divine meals, snacks and food-to-go that’s house-made using the finest of local ingredients. You simply must try the to-die-for Seven Hills Goat Chorizo! They also have their own special house-blend coffee that’s very popular with locals. Open Friday to Sunday from 8.30am. TO LIFE SEYMOUR’S MILITARY HISTORY SEYMOUR AND PUCKAPUNYAL SHARE A RICH AND HISTORIC PAST WITH THE AUSTRALIAN MILITARY. Situated 10km west of Seymour, Puckapunyal is one of the best known army training camps in Australia and includes the Australian Army Tank Museum, which hosts a premier collection of tanks, armoured vehicles, uniforms and artifacts. Just minutes from the town of Seymour is The Australian Light Horse Memorial Park which was Victoria’s largest Army base, the Seymour Camp, known to many as Site 17. Throughout the park there are scattered relics of the Army Camp days and Anzac Hill offers 360 degree views of the beautiful surrounding countryside. Enjoy exploring Mitchell Shire’s wartime heritage and discovering the proud contribution that the military has made to this area. AUSTRALIAN LIGHT HORSE MEMORIAL PARK Goulburn Valley Highway, Seymour www.lighthorsepark.org.au AUSTRALIAN ARMY TANK MUSEUM Hopkins Barracks, Puckapunyal www.armytankmuseum.com.au *BEFORE VISITING THE MUSEUM, PLEASE ENSURE YOU VISIT THE WEBSITE FOR OPENING TIMES AND ENTRY REQUIREMENTS. THIS WAS NOT A ‘LAND FIT FOR HEROES’, BUT A LAND OF HEROES! Stand in the Calder Woodburn Memorial Avenue and reflect on the need of one man to immortalise the sacrifice of his son and others like him. them for War. Eager to serve and filled with the spirit of adventure, they passed through the camps and left to fight overseas. So many did not return. Visit the Mactier statue in Tatura or reflect upon the Honouring Our Heroes statues in Euroa commemorating our Victoria Cross recipients. No other region in the Commonwealth received as many VCs during WWI, a testament to the courage, valour and determination of our local heroes. With Australia commemorating the Centenary of Anzac during 2014 to 2019 what better time to discover these stories and more throughout the Goulburn River Valley region. Download the 100 places for 100 years - Victoria War Heritage Trails app to learn more about our military history. Alternatively, call in to one of our Visitor Information Centres and ask one of our friendly volunteers. The Seymour Railway Heritage Centre (SRHC) is home to a collection of historic Victorian Railway locomotives and carriages that have been restored to operating condition. Seven Hills Tallarook is situated 5 minutes off the Hume Highway in Tallarook. The property is over 600 acres with views into the valleys of Broadford, Seymour, Pyalong and Puckapunyal. The centre was established in 1983 by a volunteer group of former railwaymen who came together to restore a steam locomotive numbered J515. Following the success of this venture, the group acquired several older diesel locomotives and displaced railway carriages and have spent thousands of hours returning the older equipment to its former glory. This is strictly a not for profit organisation run by volunteers. Seven Hills, as the name suggests, sits on seven magnificent hills and has been designed to cater for all types of accommodation and budgets, from the brand new luxurious homestead, bed and breakfast to riverside camping. It offers plenty of activities, or a hammock to just relax in! The Seven Hills Homestead surrounds a large swimming pool and courtyard, including a spa and undercover BBQ area. The horseshoe shaped homestead offers five luxurious bedrooms (two with en-suites), three bathrooms, two kitchens, two lounge rooms and large deck area. The homestead boasts breathtaking three hundred and sixty degree panoramic views. Every sunset is unique as the views. We can cater a holiday that you will never forget. Heritage train excursions are regularly conducted to locations around Victoria (see website) and restored locomotives and carriages can be used for charters, organised tours or member outings. You can enjoy guided depot tours by appointment. Close by, and within a short hop of each other are some of the State’s premier wineries- Mitchelton, Tahbilk and Fowles Wine, each with its own unique experience. Her performance and winning streak, under expert trainer Peter Moody and ridden primarily by jockey Luke Nolen, captured the heart of a nation, with many people travelling great distances to watch her race. Located on the west bank of the Goulburn River, this picturesque vineyard, established in 1975 is owned and operated by Guido and Sandra Vazzoler. Guido has many years experience making wine for large and smaller boutique producers. His family is devoted to producing quality wines on the Piave River in Northern Italy – the tradition proudly continues due to the ideal grape growing conditions at Longleat. Their cheese is hand made by Sandra, a qualified cheese maker, and is served and sold at the cellar door café which is nestled amongst the vines, providing a tranquil setting for wine and cheese tasting. Taste the wine with the winemaker and the cheese with the cheese maker - a truly unique experience. Make sure you have your photo taken with a true racing champion, in the Thoroughbred Capital of Victoria. Open Saturday and Sunday 10am – 5pm and most public holidays. Lunch bookings are required. The Nagambie Lakes area is the only wine region in Australia where inland waterways result in a cooler climate than surrounding areas. The rich red sandy loam soil also improves grape quality and adds a distinctive regional character to the local wines. Offering a fantastic calendar of events, Nagambie is also a great place for a relaxing getaway. Visitors can pack a picnic, hire a tinny or canoe, and explore the nooks and crannies, billabongs and lagoons of the tranquil Goulburn River, stopping for lunch at Jacobson’s Outlook or Buckley Park. A life sized bronze statue of the mighty mare adorns Lake Eppalock the main street, testament to the strength of the equine industry in the region. Nagambie is also famous for its major rowing regattas on the 2km international standard course on Lake Nagambie. The pretty township of Nagambie on the banks of Lake Nagambie is synonymous with boating, fishing, swimming and as the birth place of famous racehorse Black Caviar. Visit Meteorite Park in Murchison to learn about the legendary 4.5 billion year old Murchison Meteorite that broke up in the sky over the town in 1969. FINEST IN THE HEART OF THE GOULBURN RIVER VALLEY YOU CAN DISCOVER THREE OF VICTORIA’S MOST CHARMING WINERIES…TAHBILK, FOWLES WINE AND MITCHELTON WINES. ALL ARE WITHIN A 15 MINUTE DRIVE OF EACH OTHER, SPREADING ACROSS THE NAGAMBIE LAKES AND STRATHBOGIE WINE REGIONS. EACH WINERY OFFERS ITS OWN UNIQUE EXPERIENCE WITH THE OPPORTUNITY TO SAMPLE THE FINEST OF WINE AND DELIGHT EVERY TASTEBUD WITH DELICIOUS FOOD. A RELAXING WINERY DAY TRIP IS ONLY A SHORT 90 MINUTE DRIVE FROM MELBOURNE CBD, A TRULY UNTOUCHED SECRET AND MORE THAN YOU’D EXPECT! Established in 1860 Tahbilk is one of Australia’s most beautiful and historic wineries; best known for its Rhone varietals including its rare Marsanne vines (planted 1927) and treasured Shiraz (planted 1860), which are amongst the oldest in the world. Named as a ‘Winery to Watch’ by Wine Spectator Magazine, a ‘Five Star’ winery by James Halliday and Victoria’s Best Tourism Winery (three years in a row), Fowles Wine is a contemporary winery based in the ruggedly beautiful cool-climate wine region of the Strathbogie Ranges, Victoria. Mitchelton Wines is well renowned for its unique architectural design and iconic tower, along with amazing views both from a height and from the banks of the Goulburn River. The river surrounds the vineyard on three sides, shaping the environment for Mitchelton’s wines. The result is, four starkly different soil profiles, each creating individual vineyards within a vineyard. The Mitchelton team recognise that each individual block bears fruit exhibiting distinctive flavour characters. This understanding creates an intimate and focused approach to winemaking that has been applied for over 40 years, wines of distinct personality, finesse and longevity. Emerging winemaker, Travis Clydesdale is dedicated to ensuring Mitchelton’s proud winemaking legacy continues. YOUR INVITATION There’s no better place to taste the diverse range of premium Tahbilk wines than in the original and historic Cellar Door that dates back to its founding. After your tasting, take in some of the historical significance of the Winery as you wander through and around the original underground cellars (classified by the National Trust) and cellar yard buildings, dating back to the mid and late 1800’s. Cellar Door is open Weekdays 9am – 5pm, Weekends and Public Holidays 10am – 5pm. TAHBILK CAFÉ; WETLANDS AND WILDLIFE RESERVE The architecturally striking Tahbilk Café is the perfect place to meet friends for lunch or to revitalise after your wine tasting. Overlooking the Estate’s dedicated Wetlands Reserve, you can select from a diverse range of gourmet Café offerings matched to your preferred Tahbilk red or white, or just enjoy a coffee and a slice of cake and, if time permits, take a leisurely stroll along the Tahbilk Wetlands Eco Trails or a more relaxed Eco Cruise (please check for running times). Open Thursday to Monday 11am – 4pm. Bookings essential. YOUR INVITATION Fowles Wine is the world’s first winery to craft wines to match wild meat and encourage more thought around food provenance and our ‘Real Food, Real Wine’ ethos also underpins our approach to hospitality. A member of Ultimate Winery Experiences Australia (a hand selected collection of Australia’s premium wineries), expect to be welcomed by a knowledgeable and friendly team to enjoy flavours of the region through award winning cool climate wines and a delicious modern European menu. FOWLES WINE CELLAR DOOR CAFE Awarded a Certificate of Excellence by Trip Advisor and listed in The Age Good Food Guide for five years running, we offer tastings of all our wines that can be enjoyed with a range of antipasti and charcuterie, light bites or generous lunches. With a shaded courtyard and children’s playground, our Café has great spaces for everyone to enjoy. Fowles Wine is also suitable for a range of functions and can help plan and deliver a range of options that suit individual needs. Open 7 days, from 9am to 5pm, our Cellar Door Café is conveniently located just off the Hume Freeway in Avenel – we look forward to seeing you soon. MITCHELTON CELLAR DOOR The newly renovated Cellar Door offers the perfect environment to enjoy Mitchelton’s specialty, Rhône varietals, Marsanne, Roussanne, Viognier, Shiraz, Mourvedre and Grenache, as well as the renowned Riesling. Relaxed and informative tastings are available from10 am to 5 pm daily. With the new private tasting room also available by arrangement. The iconic tower’s viewing platform is open daily. THE MUSE RESTAURANT The Muse Restaurant at Mitchelton offers a Modern Australian, seasonal menu in a landscaped setting overlooking the Goulburn River and surrounding bushland. The riverside terrace offers causal outdoor dining, a great space to enjoy a glass of wine and a grazing platter. The recently renovated Montage Room is designed to cater for a variety of function, conference and wedding requirements. For more information and restaurant open hours, please phone 03 5736 2222. Located right on the waters edge, Nagambie Lakes Entertainment Centre endeavours to combine the best in “water, wine and fine dining”. Formerly known as the Valley Hotel, this renovated 1890’s building is one of Nagambie’s most famous landmarks. The Nagambie Waterfront Motel is located in the heart of Nagambie township, just 90 minutes from Melbourne on beautiful Lake Nagambie. It is the perfect place to stay during your next business trip, holiday or weekend getaway. Whether you’d like to dine in the bistro or al fresco by the water’s edge, our stunning menu and fine selection of wines are sure to delight. Meals are served 7 days a week for lunch and dinner and breakfast can be arranged if you are with a group of 25 or more. Our bar is open every day with counter meals available for lunch and dinner with member priced drinks and a welcoming environment. All 26 rooms are air-conditioned and have the standard conveniences you expect - 32” Flat Screen TV, free wireless internet access, hair dryers, irons, ironing boards, refrigerator plus tea and coffee making facilities. Some rooms offer additional amenities including pillow-top mattresses, spa baths, kitchen facilities and microwaves. For added convenience, laundry facilities are located on the premises. Our property also has a tennis court, outdoor heated pool, secure onsite parking and barbecue facilities for casual outdoor dining. CORPORATE Nagambie Waterfront Motel suits any meeting or conference of 6 to 40 persons. Our room facilities include internet, data projector, audio visual and our beautiful location on the shores of Lake Nagambie provides a wonderful breakout environment for lunch overlooking the lake or for a poolside BBQ. FUNCTIONS Our Lakeside Reception Room is designed to provide a beautiful lake view backdrop, while your guests are seated around round tables of 8 to 10 situated throughout the remainder of the room. The Reception Room is designed to cater for all types of functions, from small style event to a formal sit down reception. Located in the heart of Euroa this thriving cafe uses the best of local produce to create a modern lunchtime menu guaranteed to impress, especially when complimented with fine local wine. Albert’s also serve quality coffee, traditional teas, breakfast, homemade cakes & biscuits. Open Mon-Fri 9am to 3pm and Sat 9am to 1pm. and discover the small town of Ruffy that buzzes on weekends with its local produce and artistic offerings. gemstone jewellery Lilydale at the Rockery Gemstone MELBOURNEmuseum. HONOURING OUR HEROES Did you know Euroa and surrounds is the only region in the Commonwealth to be home to three Victoria Cross recipients? Visit their bronze monuments at VC Memorial Park. Nothing beats the experience of stopping in at a traditional country bakery. Euroa Hot Bread have won countless awards for their pies, pasties and cakes (try some and you’ll soon see why), and you’ll love the choice of their specialty breads and steaming hot coffee! Dine in or take away, open daily from 6.30am. Specialising in healthy, gluten free and vegan meals. Daily we prepare fresh sushi rolls, pies, sausage rolls, cakes, biscuits and Ciabatta bread. Our range of organic and locally sourced produce includes nuts, dried fruits, honey, herbs, spices, Avenel meat, yoghurt, tea, coffee, grains, seeds and more! Come in and try our fruit icecream and juice! Renowned for welcome hospitality, comfort, delicious breakfasts and leafy tranquil gardens, Forlonge Bed & breakfast is located in the heart of Euroa within easy walking distance to town. Choose either the King/ Spa Suite overlooking the garden or the two-bedroom Conservatory Suite with lounge and dining area. Separate entrances. Off-street parking. AAA Tourism, 4 1⁄2 Stars. A house full of the most intriguing gems, crystals and minerals from Australia and around the world.Fabulous fossils, meteorites and fluorescent minerals in colours that excite the senses plus unique jewellery and gifts made on the premises. Free admission, wheelchair friendly access, Eftpos. Group bookings welcome. Open Wed to Sun 10am - 5pm plus school and public holidays. 31-33 Hill St, LONGWOOD Ph: 03 5798 5595 www.therockery.com.au Euroa is the only town in the entire Commonwealth to have been home to three Victoria Cross (VC) recipients. Euroa is the kind of town that proudly wears its military history on its sleeve. People talk about it down the beautiful tree lined streets, and now thanks to an amazing community initiative spanning over 5 years of fundraising, you can now read about it for yourself. You will also find story boards telling the remarkable tales of these three brave souls. Thanks to the hard work and dedication of the Euroa Community, Tubb, Burton and Maygar will forever be remembered by our future generations. A must see for all visitors, Aquamoves is a state-ofthe-art health, fitness and leisure centre located in the heart of Shepparton. Inside, a 25m swimming pool is ideal for the recreational or serious swimmer. Children will love the leisure pool with water sprays, fountains, waterfalls, water slide and Mansfield rapid river. Adults can relax in the warm and cold spas, Lake Eildon hydrotherapy pool and the dry sauna. Outdoors there’s a 50m pool, leisure pool and Splash Park for both kids and the big kids at heart. Plus a beach Mt Samaria State Park volleyball court, BBQ and shaded seating areas perfect for a relaxing family outing. On the banks of the Goulburn and Broken Rivers, Shepparton is a wonderful family and sporting destination. Discover warm hospitality at our relaxed cellar door perched above an ever-changing landscape. Be guided through a wine tasting, enjoy distinctive handcrafted single vineyard wines and share a regional platter. Experience the captivating natural beauty of the Dookie Hills, fireside or on our relaxed deck. Open Friday, Saturday & Sunday 11-5pm or by appointment. 195 Major Plains Rd, DOOKIE Ph: 0437 825 547 www.talliswine.com.au. Beginning in the gardens opposite the majestic Gladstone Hotel in Dookie, the rail trail offers scenic views of rolling hills, seasonal crops and a plethora of wildlife including “Willy the Wombat”. Mt Major to the south and Gentle Annie hill to the south east, the 9.4km return journey is available to walk or ride, with low grade undulations it traverses some of the region’s most fertile farm land including the memorable Dookie Red loams and the historic St Mary’s Church (1898) in the distance. The landscape is constantly changing with the seasons, ablaze with yellow and green throughout the spring with canola, legume and wheat crops and hundreds of rolls of hay during summer. The rail trail is the ideal family outing, so pack a picnic and enjoy the hospitality of the spirited township of Dookie. premium quality aperitifs and cocktails and you can also sample some of the 30+ beers or select a drop from the exceptional wine list offering both local and international wines. Level 1 Lounge Bar, The Piano Bar and Garden Balcony are great places to chill out with friends and enjoy an icy cocktail or have a game in the adjoining pool room. Don’t forget to check out our fully heated courtyard too. Planning a function? The GV specialises in weddings and is the perfect venue for all types of celebrations and corporate events, offering multiple function spaces and a wide range of packages to suit all tastes and budgets. The Aussie Hotel, conveniently situated in the middle of Shepparton, is a family run pub that prides itself on exceptional food, great service and friendly atmosphere. With live entertainment on weekends, great function facilities or if you’d just like a quiet drink in Jacks Bar, at the Aussie we’ve got you covered! The Mooroopna Museum and Gallery hosts two distinct collections of Goulburn Valley history. Firstly, documentation of the history of our local rural industries including fruit growing, processing and irrigation. You’ll find a large collection of family histories, many personal and community items of historical importance as well as an account of Mooroopna’s military history. Secondly, an extensive collection of nursing, medical and ancillary items provided by the staff of Goulburn Valley Health, which started as the Mooroopna Hospital in 1875-6. This medical museum is one of very few in Victoria and honours the role of the hospital and its staff in the local community. Open Wednesdays 11am to 3pm, Sundays from 1.30pm to 4.00pm, or by appointment. This facility is wheelchair friendly and hosts broadband internet access for Seniors. Kyabram Fauna Park offers you an incredible wildlife experience with the largest collection of Australian animals, birds and reptiles in country Victoria. Get up close and personal with koalas, kangaroos, wombats, cockatoos, wallabies, Tasmanian devils, native geese and ducks plus walk-through aviaries, the giant insect display and ‘Getcha’ the salt water crocodile. The park covers 55 hectares of open woodland, wetlands and lakes providing habitats that attract over 140 species of native birds, animals and amphibians. Add 105 species of Australian animals, birds and reptiles, which form part of the Park’s permanent exhibits, and you’ll have so much to explore! Eco tourism at its best. You will experience timeless natural beauty and peace while gliding along through the Barmah Choke, on the Murray River, an area 25,000 years in the making. Cruises depart Monday, Wednesday, Thursday, Saturday & Sunday. Bookings are essential. Just 20 mins from Shepparton with café and playground facilities. Open daily from 9.30am to 5.30pm (except Good Friday & Christmas Day). Having a reputation for delicious food and excellent service makes the Parklake a popular dining destination. Enjoy a modern Australian menu 7 days a week for breakfast, lunch or dinner and everything in between. Dine indoors in the stylish & comfortable surroundings, or enjoy a meal on the terrace overlooking Lake Victoria & surrounding parklands. The perfect place to catch up with friends for a latte after lunch, or to enjoy a cocktail before the sun goes down. Thinking of staying the night in Shepparton? Your travels can be further enhanced by access to the property’s 80 accommodation rooms. Choose between a variety of well appointed standard, deluxe, family, spa suites or apartments. Relax & enjoy life at the Parklake. Fun City is a family entertainment complex with something for all ages, young and young at heart. Located just 4kms from Shepparton, this picturesque 18 hole course lays alongside the Goulburn River, and is lined throughout with native bush land and wildlife, for a truly relaxing golfing experience. There’s on-course golf tuition, a well stocked Pro Shop, plus spacious club house with bar and superb dining facilities. Open 7 days a week. 2 Fairway Dve, MOOROOPNA Ph: 03 5825 4135 www.mooroopnagolfclub.com Greater Shepparton’s MooovingArt is a unique and ever changing public art exhibition using a unique 3D canvas: life sized cows! Scattered throughout the region in parks, gardens, public spaces and businesses, there are more than 90 of our ever changing, colourful fibreglass girls in the herd. Each one is individual and distinctive in their persona. MooovingArt has become an integral part Greater Shepparton’s landscape over the years and it is always changing and on the mooove! Keep track of the latest herd movements and new editions by following MooovingArt on Facebook and Twitter, or check out the website for a full listing of cows with photos, locations and names. Be sure to send us your suggestions for new editions, innovative names or take part in the annual cow roundup! This most comfortable of hotels is in a prime location overlooking picturesque Lake Victoria, only a few minutes walk from a vibrant CBD, wonderful shopping and attractions. All rooms are equipped with pillow top mattresses, 42” LED TV with Foxtel, free high speed Wi-Fi, reverse cycle air conditioning, mini bar and room service. The property also features two swimming pools (including indoor heated), spa and sauna. There are 5 function rooms onsite which can cater for small groups or large gatherings seating up to 250 people. All function rooms are equipped with modern amenities and free car parking is provided. The Café-Bar-Restaurant is open daily for breakfast (from 7am), lunch or dinner. Relax and enjoy life at the Parklake. public holidays 1pm - 4pm Day and New Year’s Day SPC Ardmona Factory Sales is the largest food factory outlet in Australia! With in excess of half a million visitors each year it is classed as one of Greater Shepparton’s major tourist attractions. The savings you’ll find in this cash and carry clearance centre will amaze you with genuine discounts of between 20 to 70% off normal retail prices! Save on these well known labels... • SPC Ardmona fruit & tomato products • Cadbury • Goulburn Valley fruit • Berri • Golden Circle • Heinz • Hoyts • IXL • Greenseas • Leggo • Mac’s Shortbread • Taylors • White Wings • Yackandandah Preserves • Decor • Foster Clark • Masterfoods • MON • Sabco Homewares and many more! The new fridge and freezer section will supply a variety of cold and frozen products at awesome prices. After purchasing your bargains in the store, pop into Peaches Café next door for refreshments. They serve delicious light meals, snacks, cakes and scrumptious homemade scones. Their coffee is legendary. SPC Ardmona Factory Sales is open 9am to 6pm Monday to Friday and from 9am to 5pm on weekends. Please note they are closed Christmas Day, Boxing Day, New Years Day, Good Friday & Anzac Day. Long vehicle parking is available adjacent to the car park and in Rowe Street at the rear of the store. KidsTown is the largest outdoor adventure playground in Australia with over 160,000 people visiting from all directions to take advantage of what there is to offer. KidsTown is positioned on 5 acres with giant slides, junior slides, swings, beach volleyball court, giant sandpit with diggers, teen playground, fruit bin and dairy mazes which give the kids oodles of place to explore and play. Entry is a gold coin per person and it’s open 360 days a year. Toddlers have a wonderful time in a fenced off area of their own with a mini sandpit, slide and more (Wheelchair access is available for some equipment). Miniature train rides also operate every weekend as well as on public holidays & Victorian school holidays. You can spend all day at KidsTown with your family and friends and use the many BBQ’s in sheltered & shaded areas to cook up breakfast, lunch or an early dinner as the playground is open from dawn to dusk. KidsTown also offers a kiosk for coffee, cold drinks, ice-creams and light lunch & snacks. Large family parties, groups and school excursion are encouraged to book an area as KidsTown is one of the biggest children’s party destinations in the region. KidsTown hosts a range of small to massive events throughout the year. The biggest being ‘KidsFest’, the children’s festival which is held on the first weekend of the Victorian September / October school holidays. For more information visit www.sheppkidsfest.com.au. For more information and a price list, see their website. Local owners, Samuel & Andrew Prentice, are keen to enhance your shopping experience in their spacious, air conditioned warehouse. Shepparton Art Museum (SAM) presents a series of changing exhibitions, education and public programs, and holds a significant collection of ceramics, historical paintings and contemporary art in all media. For more information on SAMâ&#x20AC;&#x2122;s current and upcoming exhibitions and public programs, visit www.sheppartonartmuseum.com.au. SAM is open 7 days, 10am - 4pm, public holidays 1pm - 4pm Closed Good Friday, Christmas Day and New Yearâ&#x20AC;&#x2122;s Day Entry is free, and SAM is an all ability access venue. SAM is proudly provided by Greater Shepparton City Council. MANICURED COURSE HAS SEEN THE LIKES OF NORMAN VON NIDA, GENE SARAZAN, AND NICKLAUS PLAY HERE IN EXHIBITION GAMES IN THE HALCYON DAYS. NOW THERE’S A NEW CHAPTER... WITH THE EMERGENCE OF JARROD LYLE, AND HIS REMARKABLE STORY. Located just 2 hours from Melbourne, the fairways are uncrowded and the green fees reasonable for such a challenging and well tendered course. The club boasts 11 on course motel rooms, all with panoramic views of the course. After playing a round, be sure to enjoy a bite to eat and well-earned refreshment with unrivalled views down the 18th fairway from the club’s balcony. The course is open to social play most days of the week. For full details simply contact the Pro Shop. Golfing groups are always welcome. Captain Detmers, commander of the German Raider HSK Kormoran which sank HMAS Sydney in 1941. Tatura Museum houses a unique collection based on 3 main themes - the history of irrigation in the Goulburn Valley, the local and family history of Tatura and District www.discovershepparton.com.au since white settlement, and the history of the seven Prisoner of War and Internment Camps in the area during World War 2. Rather than being a generic historical museum, every article on display has a direct connection with Tatura. The collection and reference library are a valuable source of research material for academics, school children, relatives and former residents. Open 1 – 3pm weekdays, 2 – 4pm weekends & public holidays. Adults $5, Concession $4, Children $2. Experience history, wildlife, our majestic rivers and more with the guide “Walk into Greater Shepparton” guide. This A WAlking greAter SheppArton Including the Yahna Gurtji Shared Path Network pocket guide is sure to encourage you to experience the region by foot with comprehensive information of tracks and trails within our townships. From our busy urban streets, to our peaceful riverside pathways, our city, our towns and rural areas can be explored where you will discover amazing public art, our Wartime history, Aboriginal heritage and much more. The guide is as informative as it is entertaining and you will be sure to discover parts of the region you never knew existed! Filled with informative individual walk features and useful and easy to read maps, contained are tips and tricks as well as potential hazards and all walks have been evaluated for accessibility. A visit to the Greater Shepparton Visitor Centre will reveal a range of experiences to engage and entertain. Our Volunteer Visitor Experience Enthusiasts will share their local knowledge and tips to make your visit to Greater Shepparton a memorable one. The Visitor Centre can help plan your stay, what to see, where to go, shopping, dining out and touring routes including: Arts and Culture, Food and Wine, History and Heritage, Fun for Families and for the more active, cycling and walking routes. Our friendly staff are always on hand for locals also, and can help you “Discover Your Own Backyard”. Our professional team can give guidance on accommodation options and can provide assistance for larger groups and conferences. A tour guide service is also available for coaches and walking tours, bookings are essential. A Cycle in Greater Shepparton guide is also available online, with a new edition available in the near future. The Alexandra Spring Fair (November long weekend) is an exceptional opportunity to sample local wineries, trout or meat products, jams and chutneys, or other local artisan wares. With a full day of music and entertainment, food stalls, craft markets and kids entertainment it’s easy to spend a full day enjoying Alexandra’s welcoming atmosphere. Date: November long weekend. Unveiled in 2014, the Victorian Truck Drivers Memorial was built to commemorate the Victorian truck drivers who have lost their lives on Australian roads. We welcome you to join us for a memorial service to support Victorian Truck Drivers and their families, held on the Saturday of each June long weekend. Eildon Big Fish Challenge & Food and Wine Festival is hosted on the 3rd weekend in October. Growing year on year this event is enjoyed by hundreds of families and avid anglers. So come and cast a line or just sit back and enjoy the food, wine and entertainment on offer throughout the weekend. Visit Alexandra over Easter and make time for the annual Easter Fair. Whether you’re interested in the craft and produce market, are looking for the wealth of kids activities or just want to sit back and enjoy a day of music and entertainment the Easter Fair has something for everyone. Date: Saturday, June long weekend. 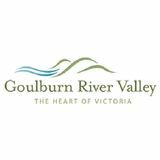 www.hear tofvictoria.com.au info@goulburnrivervalley.com.au or call in to any of our friendly Visitor Information Centres. Explore the Heart of Victoria with the Goulburn River Valley Tourism Holiday Planner.